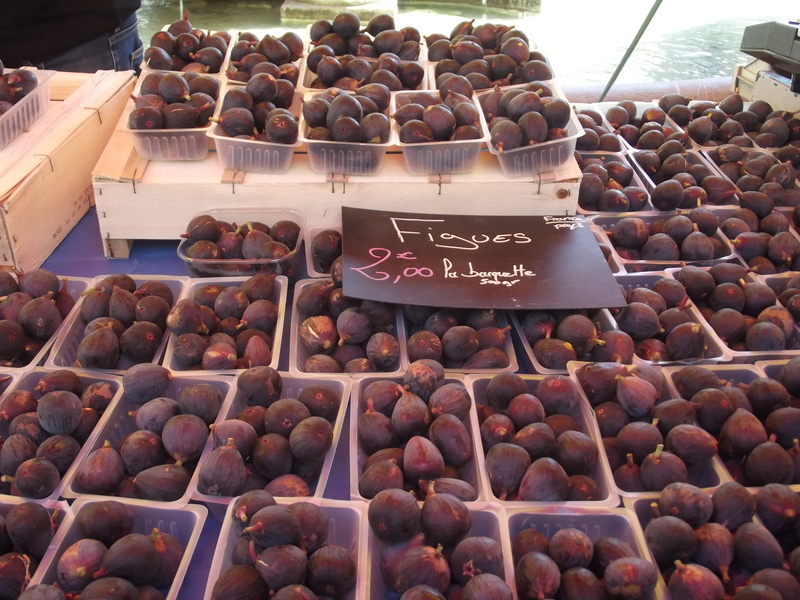 There’s nothing more French than a French Saturday market. 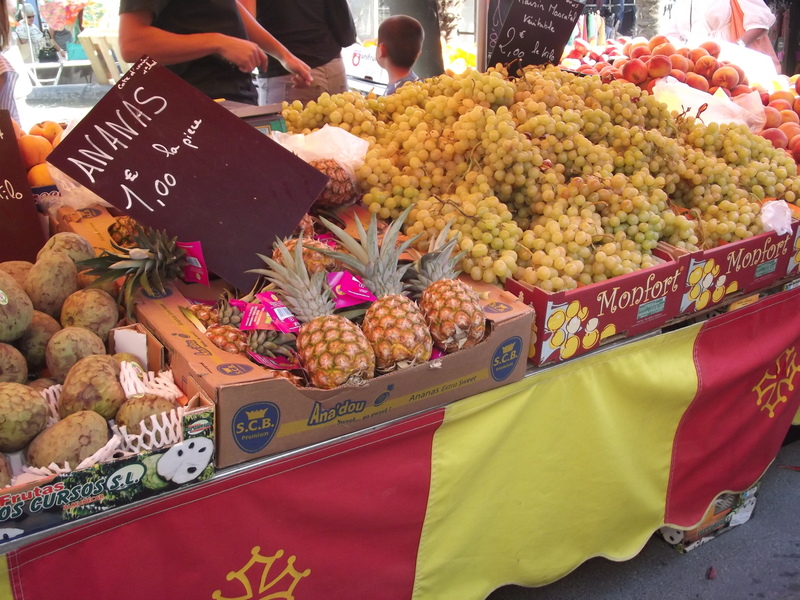 In towns, villages and cities all across the country markets pop up at the weekend (and many weekdays) selling fresh fruit, fish, meat and a lot more. 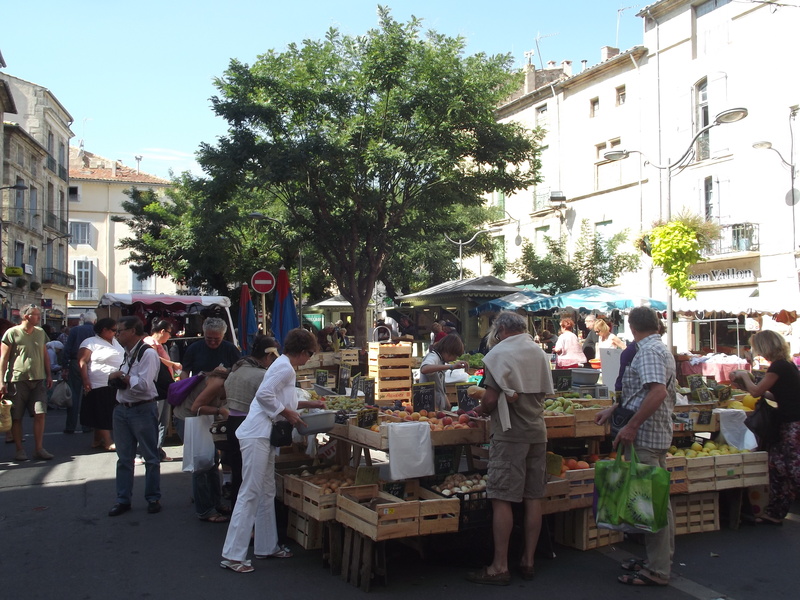 In Pezenas, made famous by Moliere’s visits with his theatre group, the Saturday market stretches right through the town from the war memorial down to Le Moliere Restaurant et Hotel. There’s fish, both fresh and salted or smoked. Some were the catch from that very morning and glistened like pieces of silver. The fruit and vegetables section of the market is lively and jostling; people spend hours squeezing, poking, smelling the produce, turning it over and over in their hands and discussing the details in depth. 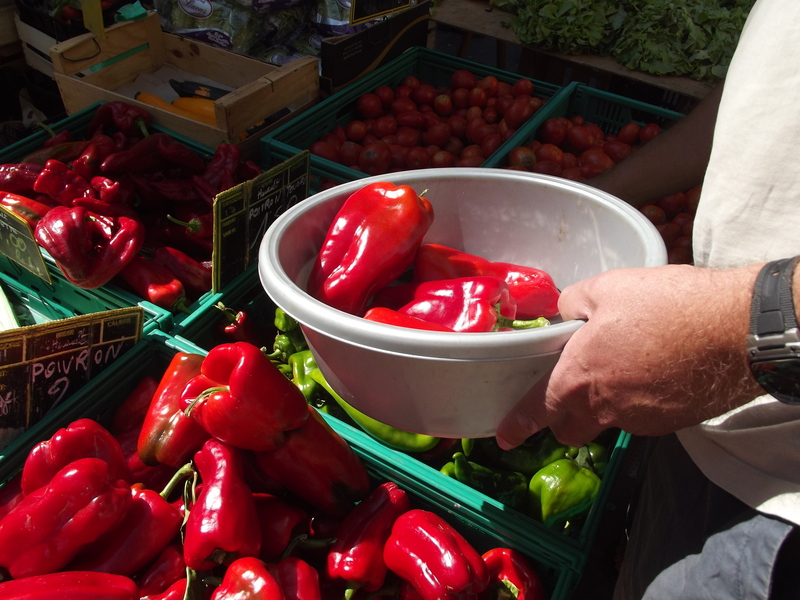 There were punnets of dark figs, rolling mountains of white-green grapes, bulging red peppers glowing a hot red in the sun, and a mushroom grower with a cigarette hanging out of the corner of his mouth selling his wares with hands so engrained with soil they had turned the same colour. As well as fruit, you could buy a woven basket to carry all your shopping around in, clothes, shoes, soaps and bags of lavender for keeping away the moths and scorpions. My favourite non-food store was the one selling linen and table clothes. 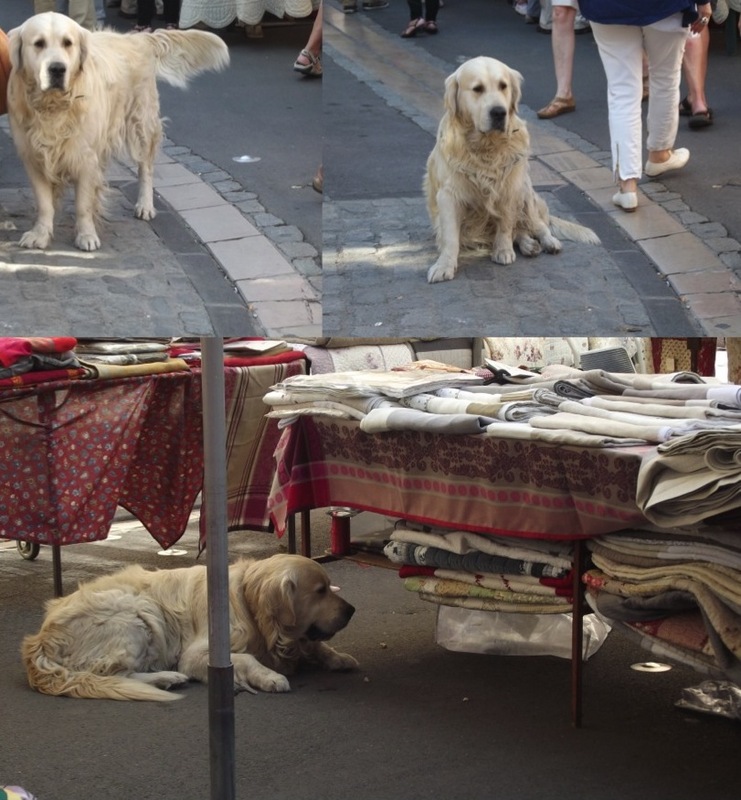 As the man running the store limped about with a beret on his head advising his customers on materials and lengths, his enormous but adorable golden retriever followed him around loyally. At one point he stood guard just in front of the store, lying right in everyone’s way. No-one had a cross word to say to him even when they did fall over him, his huge doleful eyes ensuring everyone forgave him. When he returned to his master’s side he flopped onto his feet, and melted as the man scratched his chin and advised a couple about table cloths. Next time I go I must find out the dog’s name. No visit to the market is complete without a coffee afterwards. 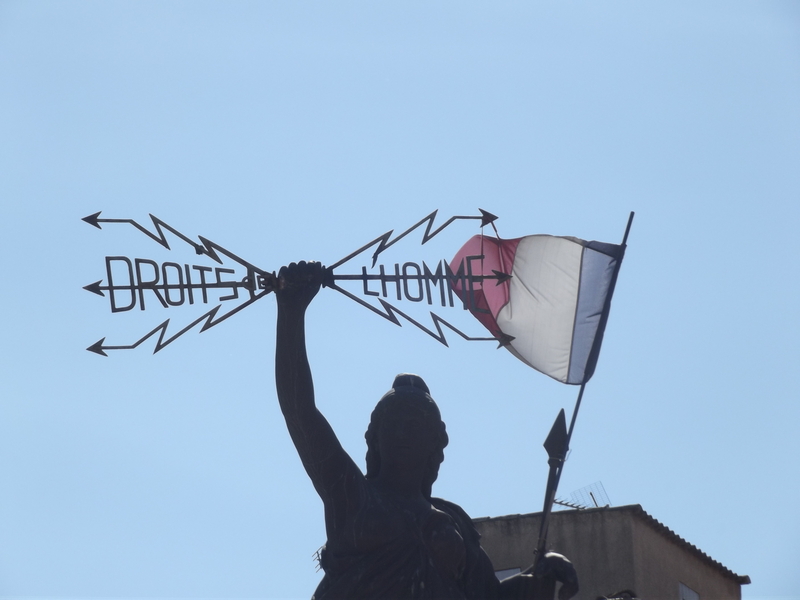 Sitting close to the centre of the market meant you could still watch the crowds and sit under the central fountain, with the statue of Marianne holding a sign declaring ‘Droits de L’homme’ (rights of man) in one hand and the French flag in the other. 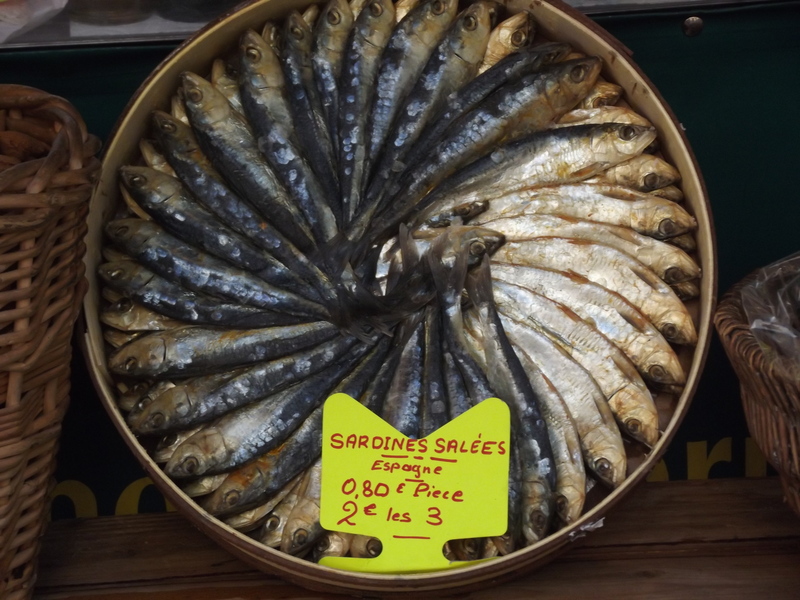 French markets are a microcosm of French ‘provincial’ society; if you want to learn what life is like outside the big lights of the cities of France, visit a small town market and you’ll have a living, breathing classroom.